The E. & G.G. Hook tracker organ was installed in the church in 1867. In 1933, the tracker action was replaced with an electrical action. In the 1990s, the electrical action began to fail and the organ was unreliable, requiring minor repairs frequently. The Church’s Music Committee discussed the matter and with the advice of Barbara Owen, an eminent organ historian, decided the best course of action would be to replace the electrical action with a tracker action. The committee felt that this would make the organ more authentic historically, and the tracker action could be expected to last much longer than an electrical one would. A fundraising committee was set up to raise the money to restore our historic organ. The committee raised the sum of $165,000, and the Andover Organ Company built a new tracker organ using only the pipes and case of the original one. The restored organ was installed back in our church in the summer of 2003. A rededication service for the organ was held on November 2, 2003 and on March 14, 2004, Peter Sykes, a renowned organist from Boston, gave a celebratory concert to demonstrate the organ. 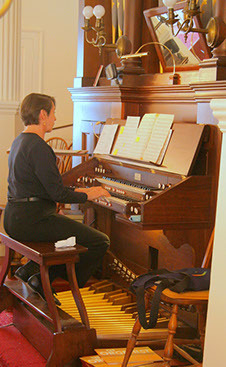 Our organ has been described as one of the best in southern New Hampshire.